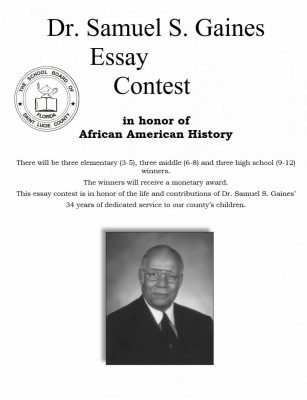 The Dr. Samuel S. Gaines Essay Contest in observance of African American History Month is something our students look forward to each year. Describe a person/an African American in St. Lucie County (not a family member), who has impacted your life, and explain what this person has done to make such a difference. Essays should be typed or neatly handwritten with minimal or no errors. 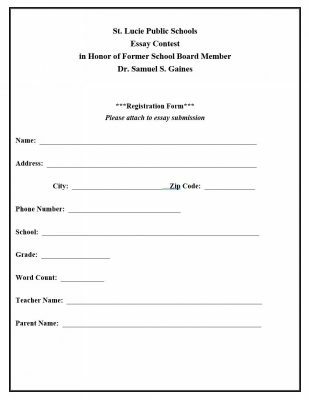 Submissions must include a completed registration form attached to the essay. All submissions must be received in School Operations no later than Friday, March 8, 2019 by 4:30 p.m. Please submit all essays to the attention of Annette Jackson / Superintendent’s Suite @ AFK8. As in year’s past, we are asking each school to send THE TOP 5 ESSAYS FROM EACH GRADE LEVEL. Essays that do not adhere to the guidelines and due date indicated on the flyer will not be considered.